HTC takes another stab at the Titan with this 4G follow up called the Titan II. Aside from support for LTE, this smartphone sequel also adds a monster 16-megapixel camera. 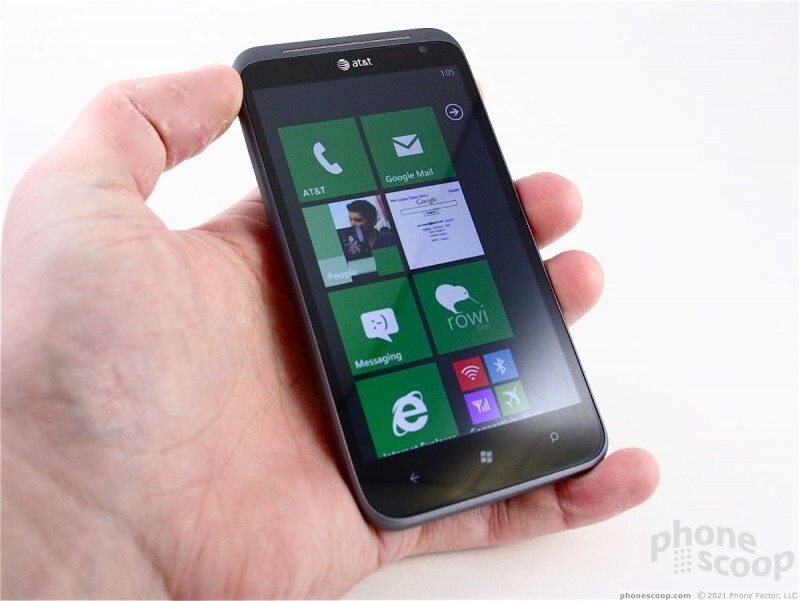 Is this a better option than the Nokia Lumia 900? Phone Scoop let's you know. HTC updates last year's Titan with a fresh design, LTE, and other under-the-hood goodies. 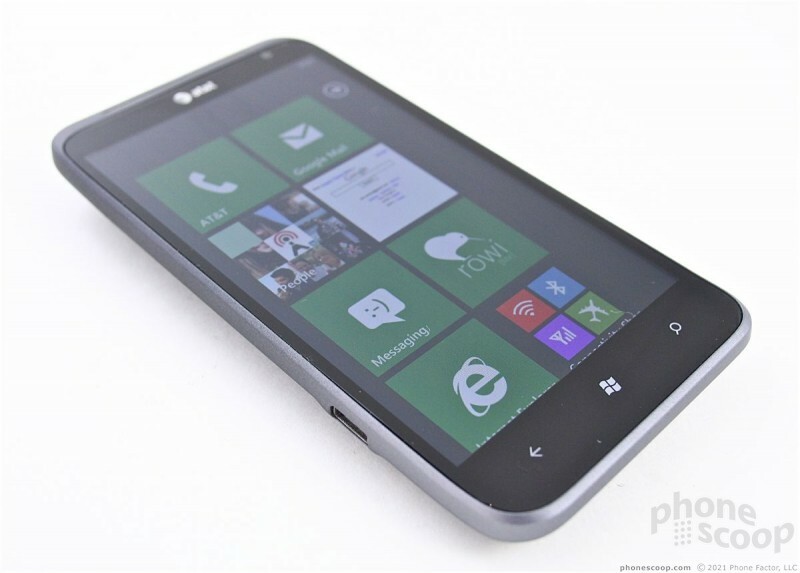 With the latest version of Windows Phone in tow, the Titan II is a big phone that should be big on performance. The Titan II isn't all that much different from the Titan, though it definitely has its own character. The basics are the same: it's big, heavy, and one serious-looking smartphone. Where the original Titan stuck with the design themes used by HTC throughout 2010 and 2011, the Titan II changes up the appearance just enough so that it blends in better with HTC's newer "One" series of devices. It uses gray, metallic-colored materials with black glass and a few silver accents thrown in for good measure. The result is a straight-laced, conservative appearance that would be at home in the boardroom. 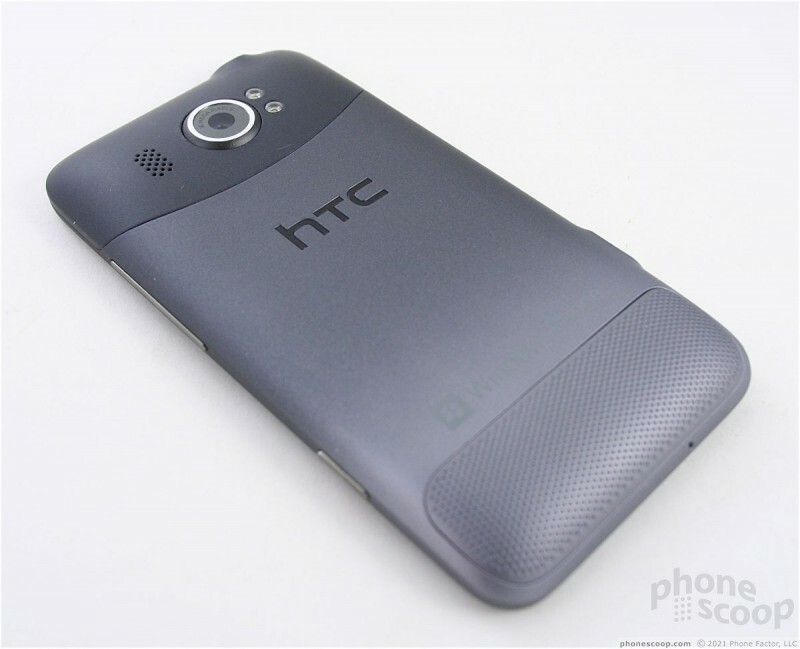 Returning a bit to HTC tradition, the Titan II (T2) has a very slight chin at the bottom. It's not as pronounced as the HTC One V's chin, but it's there all the same. 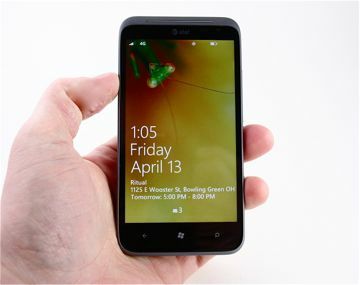 Given the size of the T2, it's a tough phone to wrap your hand fully around. 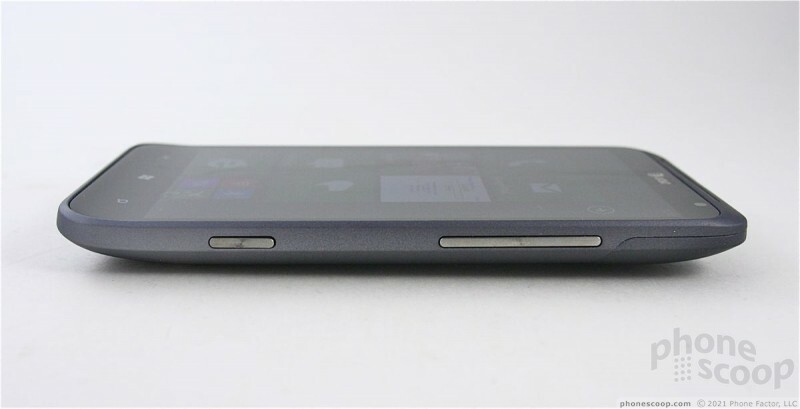 There's a large bulge on the back surface, encompassing the top one-third of the phone. This is where the camera module and speaker for the speakerphone are located. It adds girth to an already-big device. The materials have a decent feel to them, and a soft-touch finish of sorts. The finish gives the T2 a bit of grip, but not enough that you can't easily slide the T2 into your pocket. The T2's display is surrounded by a lot more bezel than I care to see on any device. The earpiece is a thin slit that it squished between the bezel and the top edge of the phone. 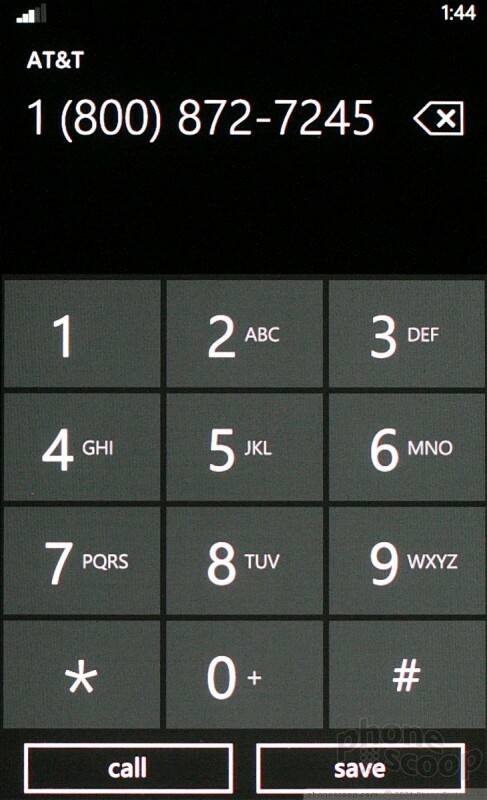 The three Windows Phone control buttons are capacitive and built into the display's glass panel. Oddly, pressing directly on the arrow of the back key didn't send the T2 back a screen. Instead, the sensitive spot was a few millimeters above the arrow. Perhaps the arrow wasn't painted in the right spot? 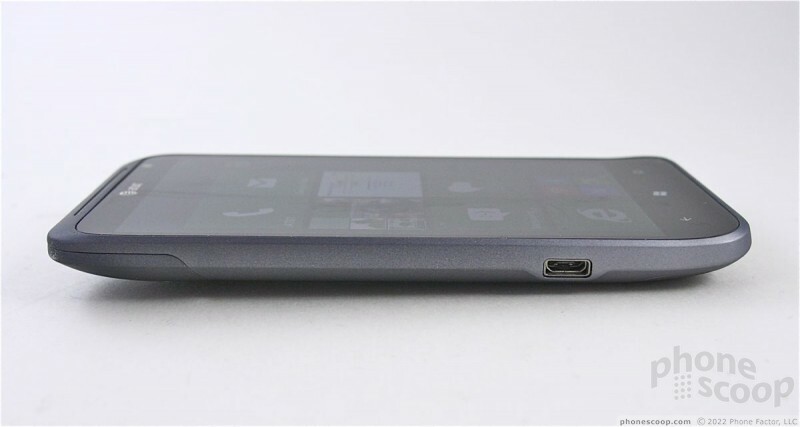 The microUSB port is on the left edge of the T2. There's no hatch or cover for it, so it's always easy to get to. The volume toggle and dedicated camera button are both on the right edge. The volume toggle is a thin sliver, but thanks to its texture and shape it stands out nicely and is easy to find. I wish travel and feedback were better. For whatever reason, HTC has trouble designing a great volume toggle. The dedicated camera button has the same texture and design idea behind it, so it, too, is a cinch to find with your thumb. It's a two-stage button, and has excellent travel and feedback. I wish I could say the same for the lock button, but I cannot. The design isn't unique, and it's too flush with the top edge of the T2. It's hard to find, and the travel and feedback is rather poor. The 3.5mm headset jack is also on top. The T2 does not have a removeable battery. It does, however, have an odd removable hatch on the back. Removing this piece of plastic exposes the SIM card. The SIM card can be removed, but there's no access to the battery, nor any sort of memory card slot. The T2 isn't the sexiest smartphone ever, but it's sharp enough that it doesn't offend. I wish some of the buttons worked better, but overall, the T2 is a fine piece of hardware. 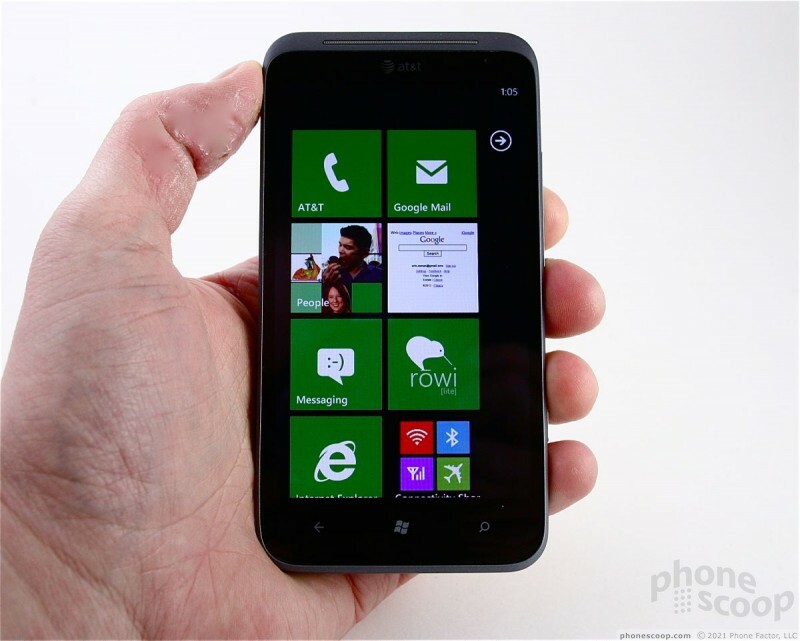 The T2's display measures 4.7-inches and includes the standard 800 x 480 pixel resolution that all Windows Phones share. 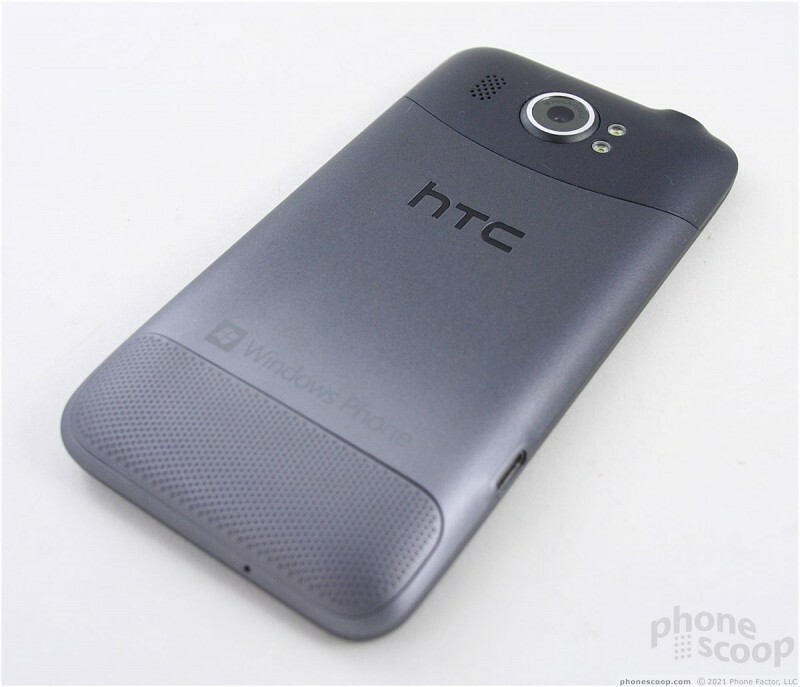 It looks good, but it isn't as impressive as the HD panel HTC put on the One X, for example. The resolution limitation is one that Microsoft, not HTC, needs to surmount, and I find that it puts Windows Phones at a bit of a disadvantage now. All that said, the T2's display is still very good. 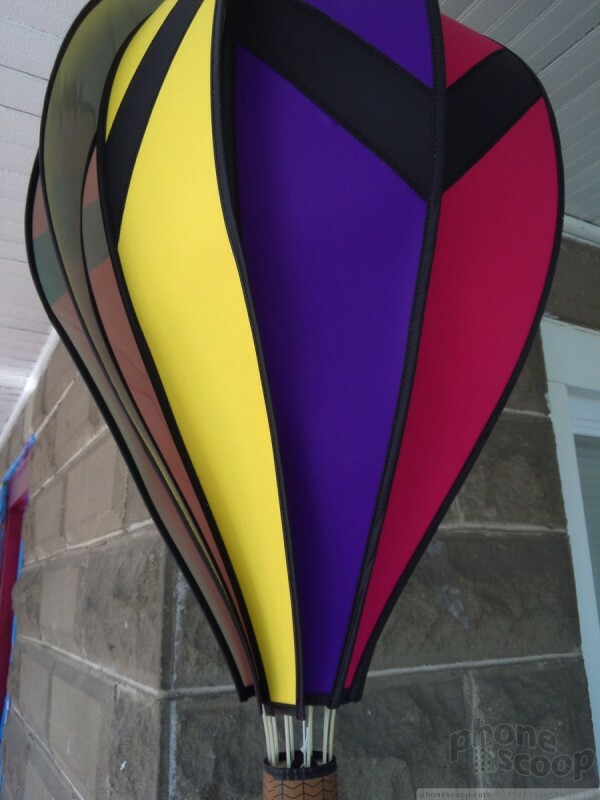 It's sharp, clear, colors look great, and it can still be used out in bright sunlight. On AT&T's HSPA+ network, the T2 performed on par with other AT&T phones. That means it showed the same number of bars in a given area. I found the T2 often got "stuck" a few times. It would flat out refuse to pull down data even though it reported 4 or 5 bars of coverage. When it was in this state, it couldn't use the data network at all, even though other AT&T phones could. Only a reboot would fix it. The T2 was able to make phone calls, though. In fact, I had no trouble making calls at all with the T2, nor did the phone drop any. As for AT&T's LTE 4G network, the T2 found it, but waffled a lot between HSPA+ and LTE. It didn't stay firmly connected to LTE in New York City for long before it would drop to HSPA+. I can't say that data speeds over LTE were any better than they were over HSPA+. It all felt about the same to me. 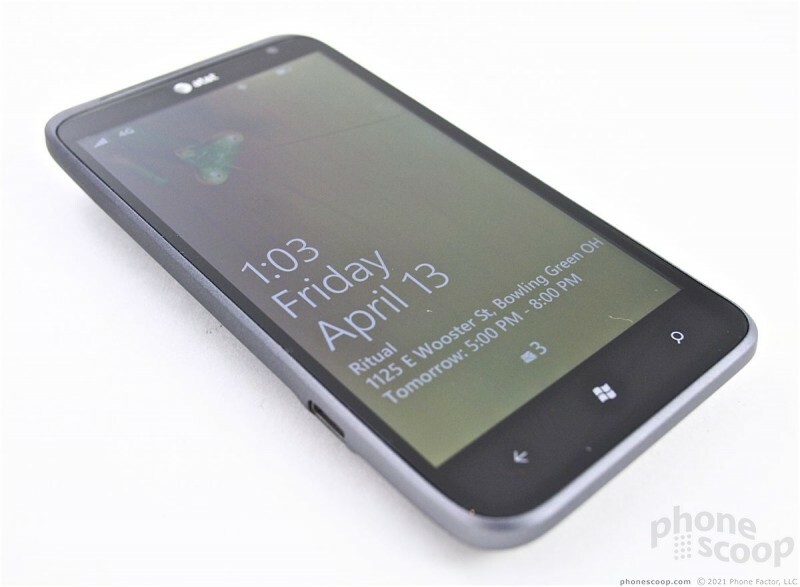 By way of comparison, the Nokia Lumia 900 was more consistent about connecting to AT&T's LTE network and remaining connected to it. The T2 is a very good voice phone. I made a number of calls when walking about Manhattan and found the quality of calls was excellent. The earpiece was plenty loud enough and could be heard above the herds of tourists cavorting about Times Square. The speakerphone sounded just as good, and was also loud enough for most places you might need to hear it. Ditto for ringers and alerts. I had no trouble hearing the T2 no matter how much background noise there was. 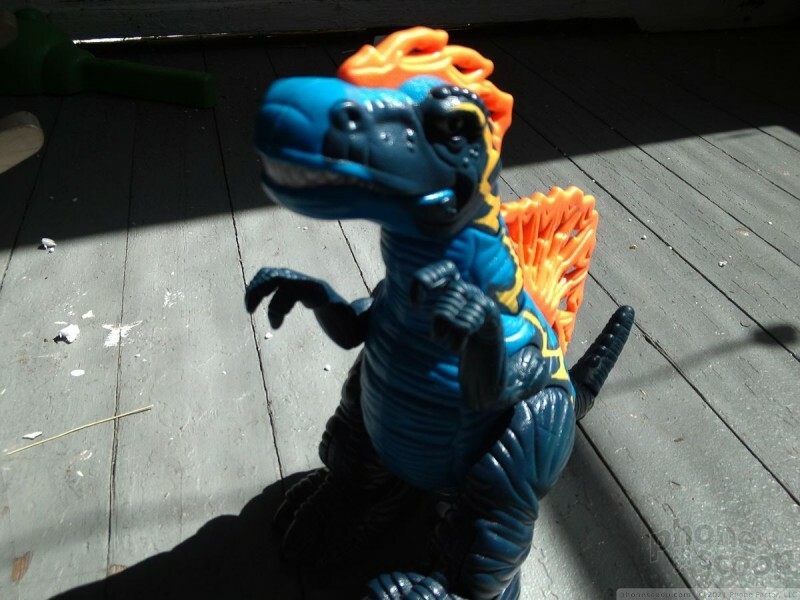 The vibrate alert isn't totally awesome, but it's not terrible. Battery life with the T2 depends highly on where the device is used. When used in 3G-only areas, the battery is fine. It easily lasts an entire waking day. When used in areas with LTE 4G, however, it drains much faster. How fast? Try from a full charge to less than 50% in about 5 hours. In this 5-hour period, I was using the device to check email and Twitter, to take pictures, and browse the web. I also used maps for a bit. I didn't listen to music, nor watch video, nor use Wi-Fi or Bluetooth. I'd call it average use. I suspect heavy use under LTE coverage could lead to a dead battery by dinner time. (There's no control for turning off the LTE 4G radio, it remains on constantly.) In other words, be careful when you're using the 4G network. 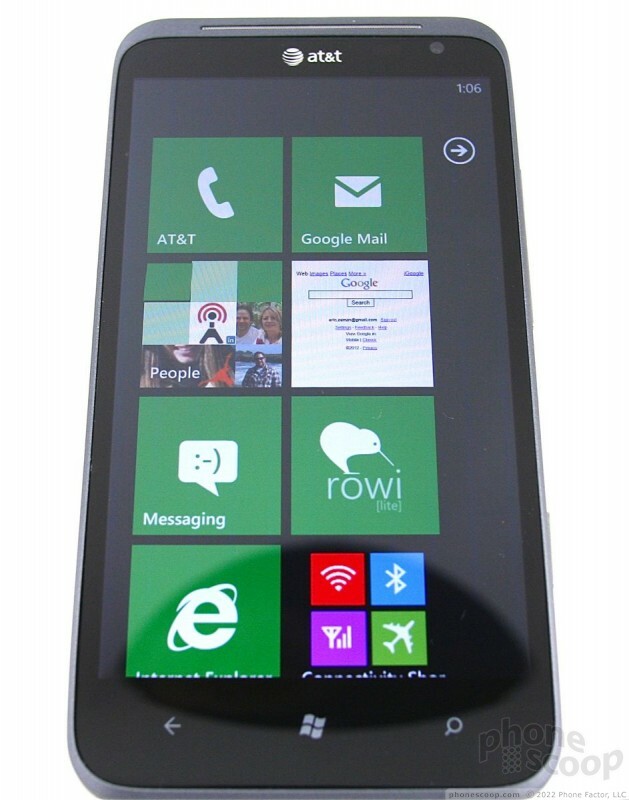 The T2, like the Nokia Lumia 900, runs the latest version of Windows Phone 7.5. 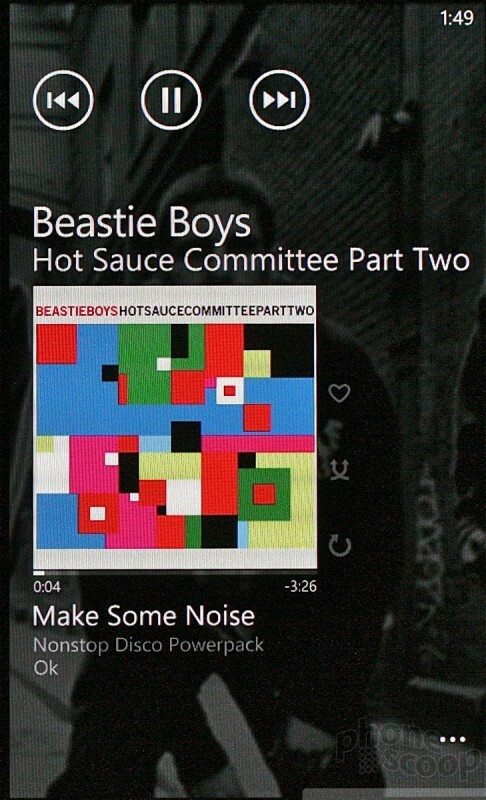 On the surface, it doesn't behave any differently than Windows Phone 7.0 or 7.1. 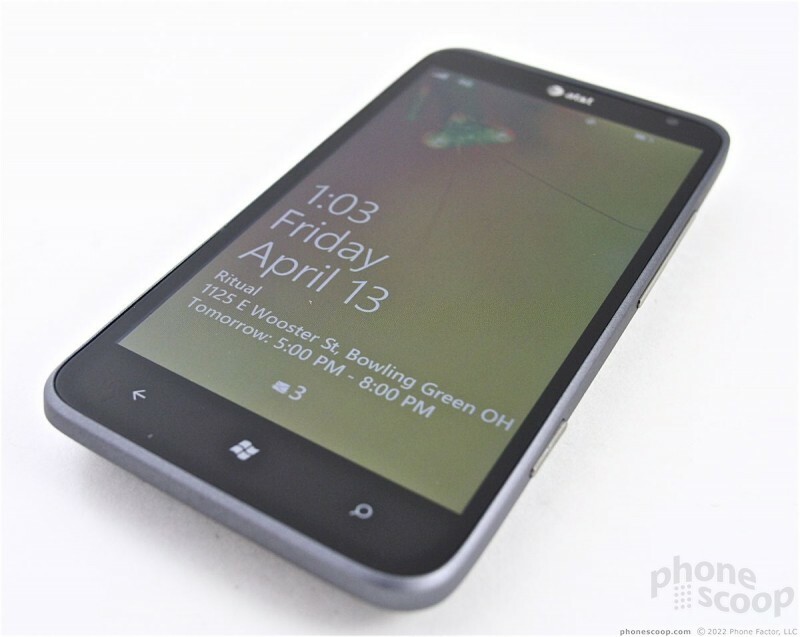 As far as modern smartphones go, Windows Phone is about as simple as it gets with respect to the user interface and it offers most of the coveted features. 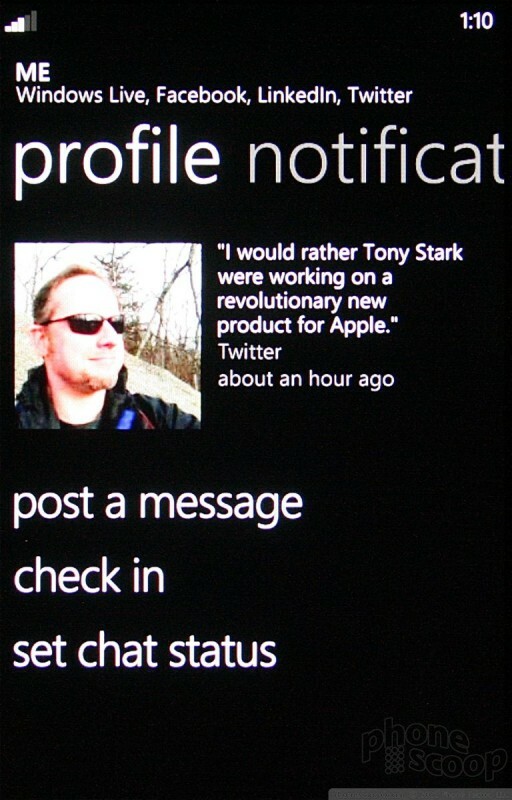 The lock screen offers up notifications for items such as missed calls or messages. They will appear along the bottom of the screen. Slide the screen up to unlock it. 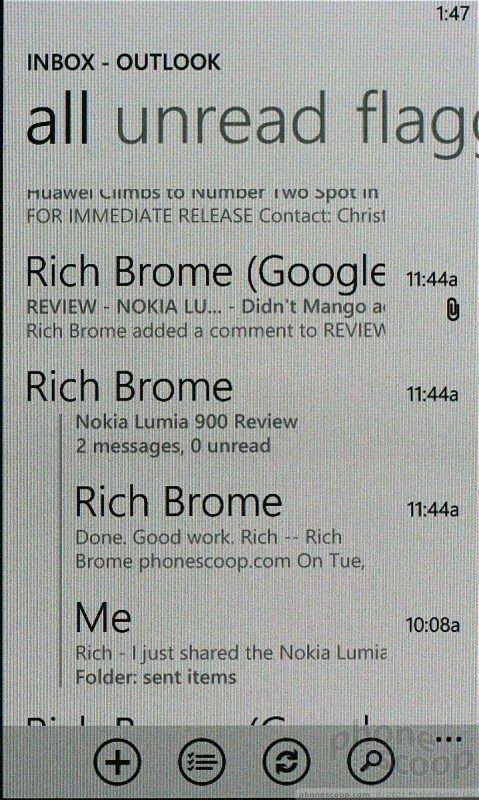 As I've noted in other reviews of WP7 devices, the notifications are limited to providing an unread count, but don't offer previews of text messages or missed calls. The only lock screen shortcut available is to the camera, which you can reach by long-pressing the camera button. There is but one home screen panel, though it is infinitely long. 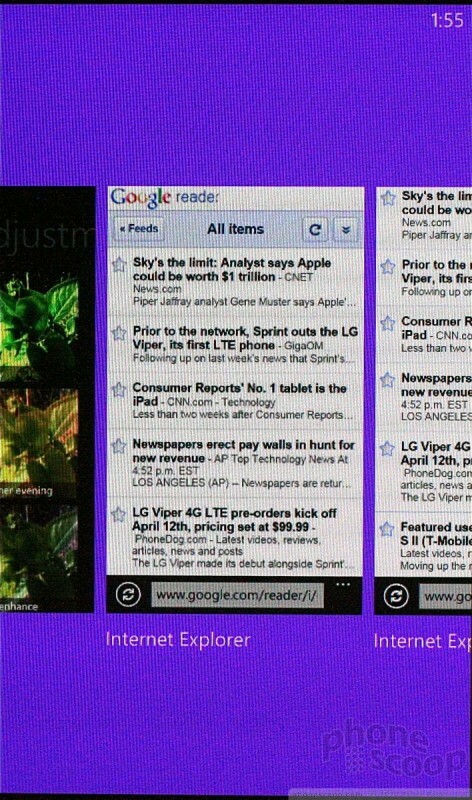 Home screen elements are arranged in vertical columns made of squares and rectangles. 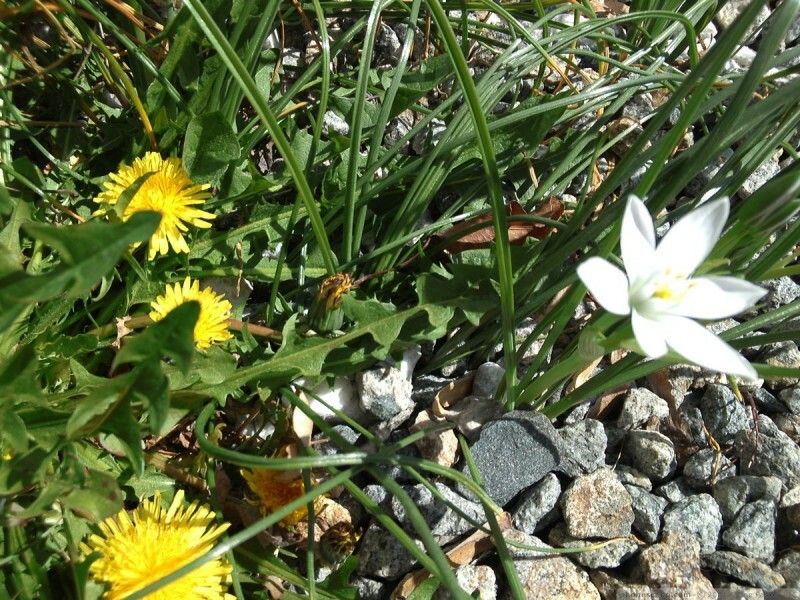 There are no widgets, but some of the squares/rectangles — or Live Tiles in Microsoft parlance — have live, updating information, such as the weather report. You can arrange these tiles however you wish, and add or delete them. 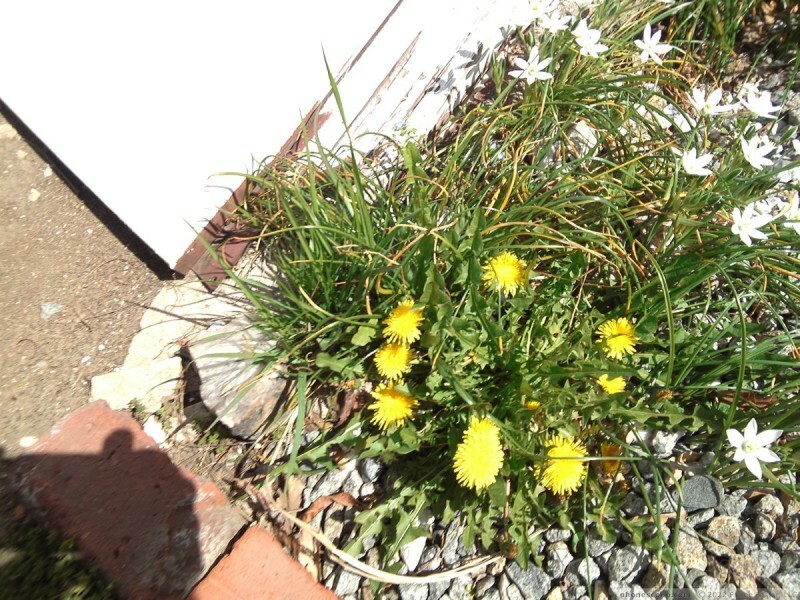 The one neat thing about them is you can pin really specific things to the home screen, such as a particular email folder, or pictures posted by Aunt Tilly. 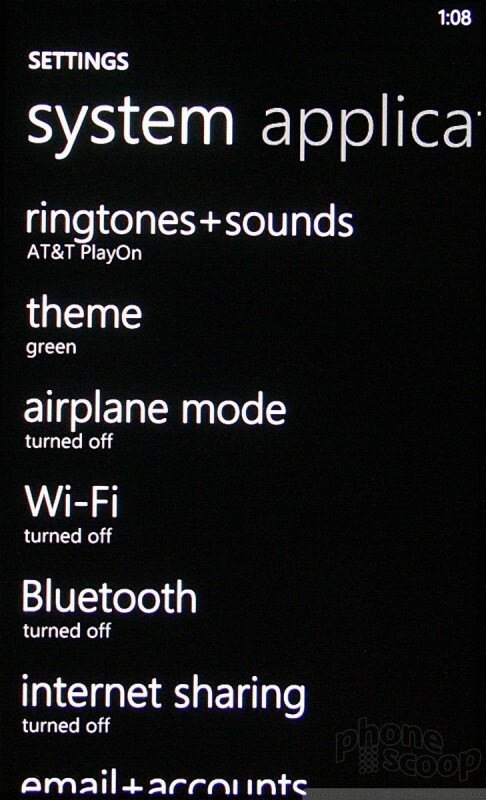 Slide the home screen to the left to access the system menu, which offers a list of all the apps/services on the device and the controls for the phone's behavior. This list is in alphabetical order and can't be rearranged. Settings of individual apps can be tweaked from either the system tools or within the app directly. In order to adjust app settings, look for the three little dots (probably at the bottom of the screen). Those are the basics, such as they are. As far as performance goes, you have nothing to worry about. The T2 is a really fast phone. Nothing about the UI is slow or stuttery. Apps open in a blink, and close just as fast. I was able to multitask quickly between five different apps with no problem. Windows Phones have no speed issues in my experience, and the T2 doesn't break the streak. Opening the phone app takes you to the call history first. 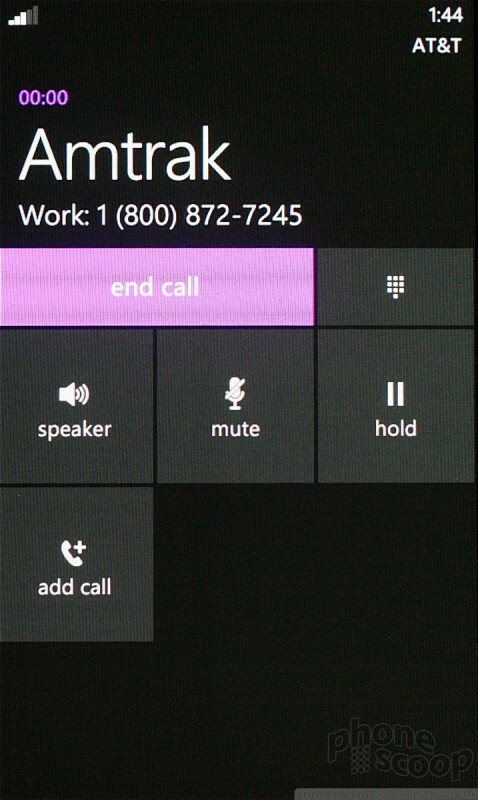 In-call options let you add a line, mute the microphone or fire up the speakerphone. 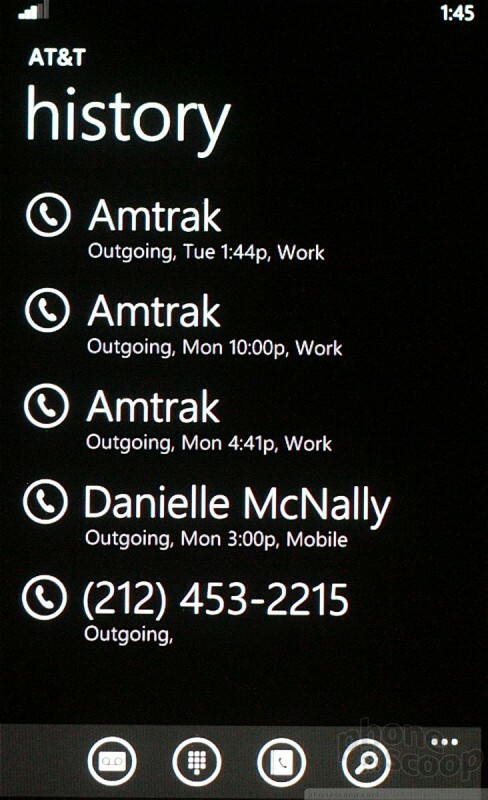 For people you call frequently, feel free to pin them to the home screen, which allows you to dial them directly. Rather than sift through a list of contacts, Microsoft prefers that you wade through the people in your life in a more immersive, picture-esque way. You won't find a contact app on the T2, but you will find the People Hub. Microsoft's idea for the People Hub was to take social networks, tie them to contact cards, and create a living, breathing part of the phone that's constantly up-to-date when it comes to your friends, family, and other contacts. It pulls in content from Twitter, Facebook, and LinkedIn, and displays not only what all your peeps have been up to, but also shows your own most recent status updates. Contact cards hold reams of data and make it easy to send messages, start calls, or fire off emails. 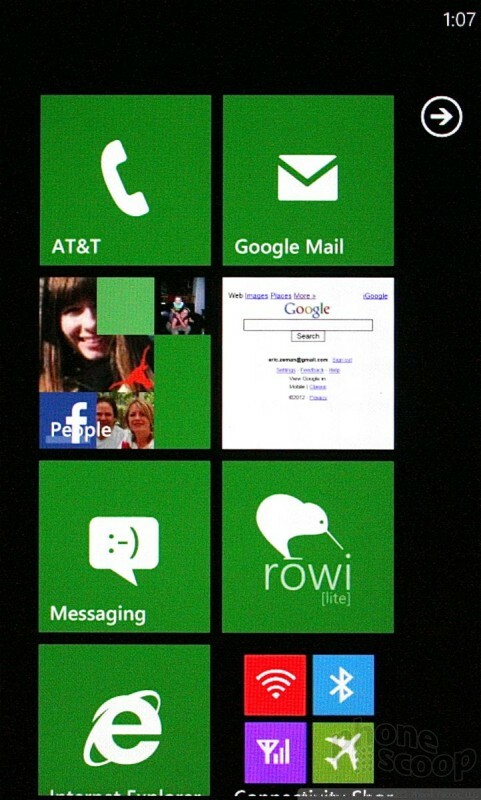 The T2, as with all Windows Phones, manages communications and messaging quite well. The SMS/MMS app matches the capabilities of other platforms, offering threaded conversations and in-line embedded media. 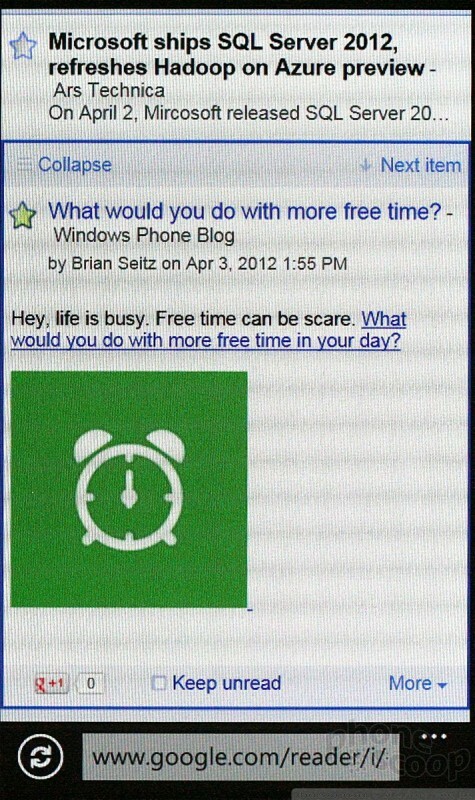 The SMS app is also used for the Windows Live IM service. Google Talk, Yahoo, and AIM aren't supported out of the box, so you'll have to go fish in the Marketplace. Social networks are integrated at the platform level. 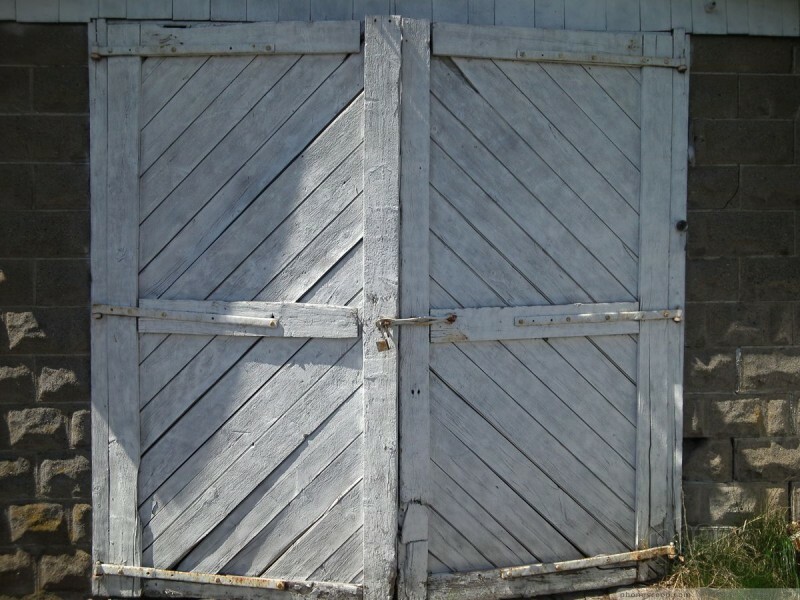 Since Facebook, Twitter, and LinkedIn are baked into the People Hub, you don't have to actually download and use dedicated apps for those services. You can do all the basics, such as post your status, read through direct messages, and see what other people are up to. It's all easy and seamless and works with but a few swipes and presses. Beyond the native integration, you can of course use these social networks on their own. 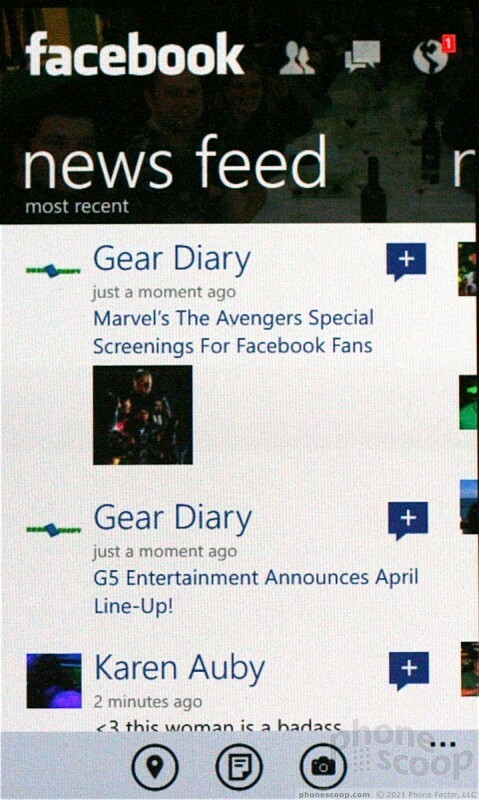 Facebook for Windows Phone is close to being on par with the client offered to Android and iOS devices. 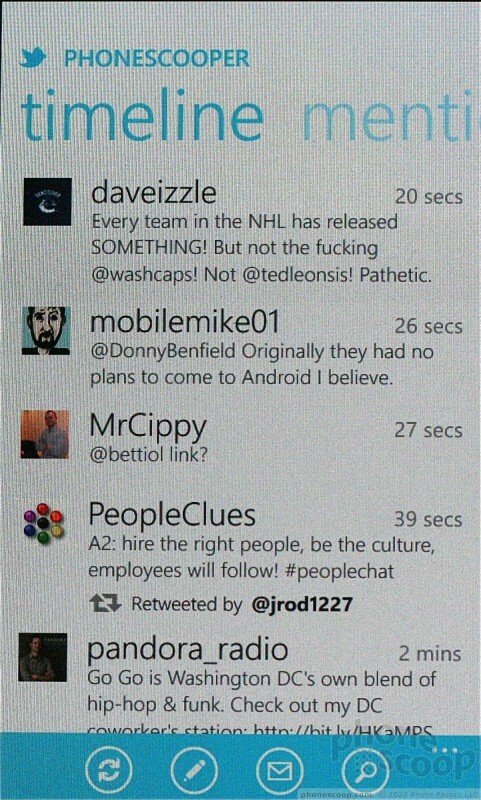 Twitter, on the other hand is a decrepit app that hasn't been updated since 2010. Yeah, 2010! 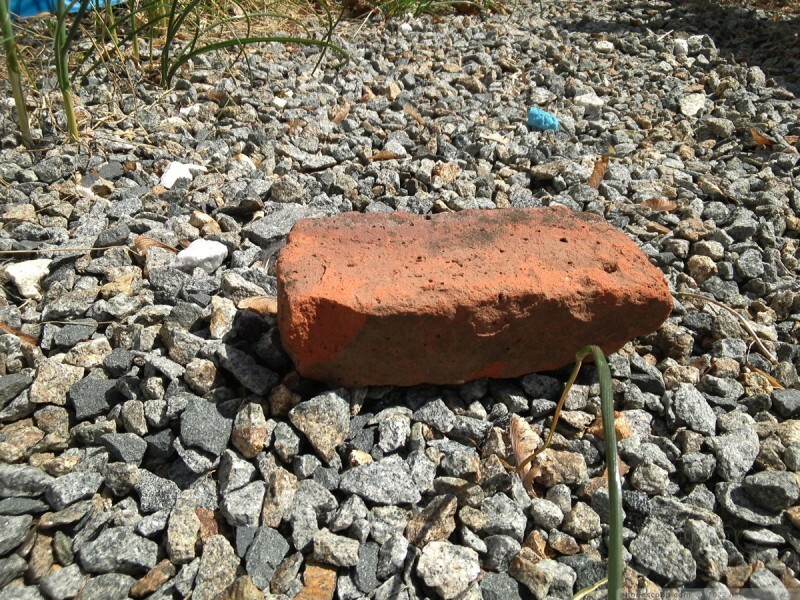 It is slow, unreliable, and the user interface just doesn't get the job done. 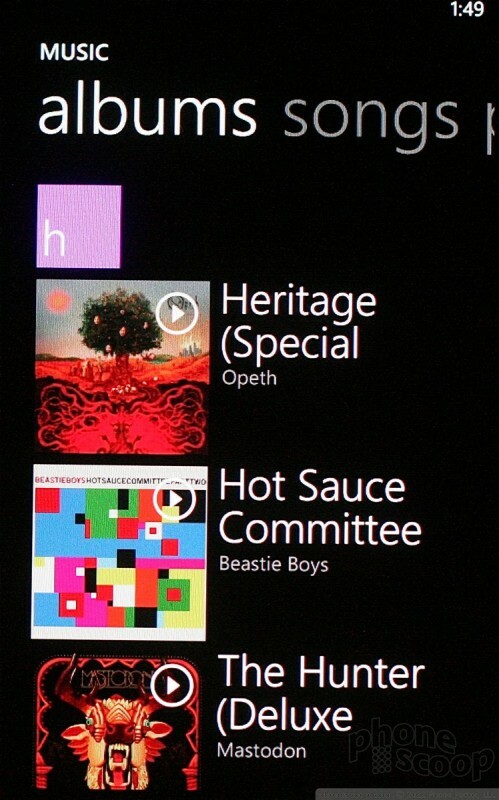 Microsoft's Zune software is the Hub for music, video, and other media-type content on all Windows Phones. 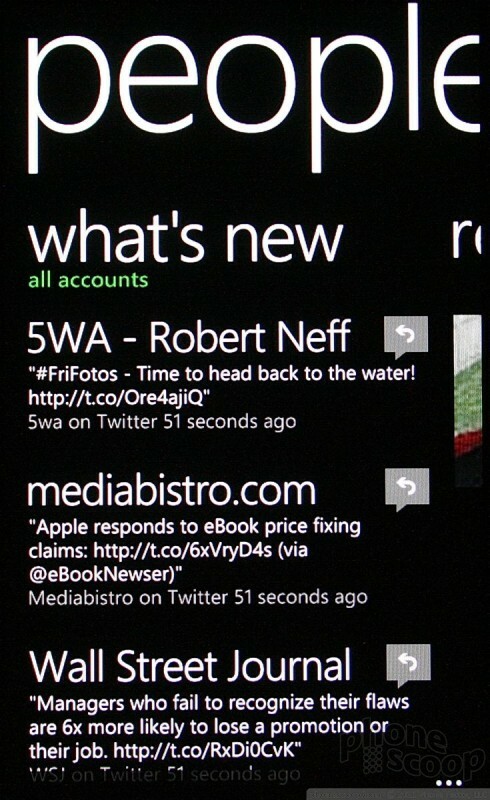 It's not only the media player app, but has the Windows Marketplace for Mobile tossed in, too. The user interface for playing back media is fine, and does all that I want it to. 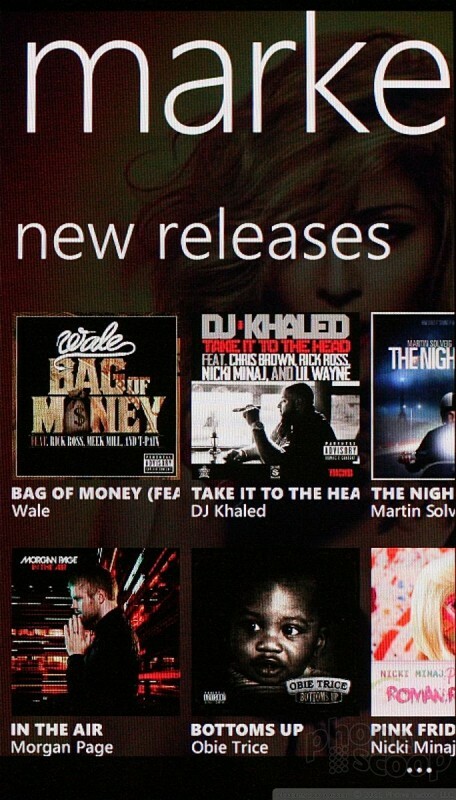 I like that Microsoft automatically pulls down artist info from the Zune store. Syncing with your existing music library, whether it be on a Mac or a Windows machine, is easy to do with free software. 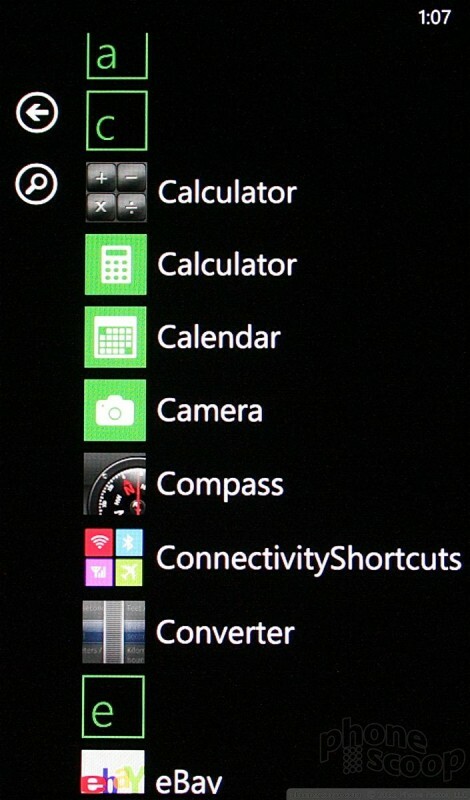 The newest version of Windows Phone supports a feature called connected apps. What it does is recognize applications that are all related. 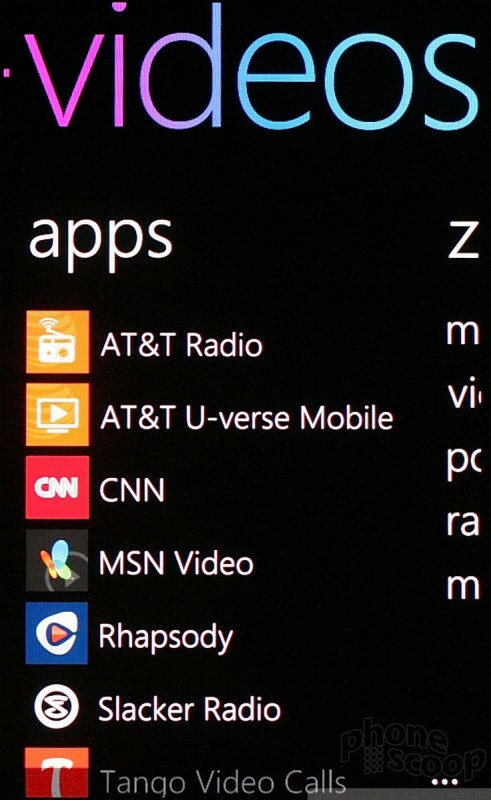 In the Zune Hub, for example, this means that if you've downloaded Slacker, Vevo, and Rhapsody on your own, you'll see all of them in the Zune Hub. 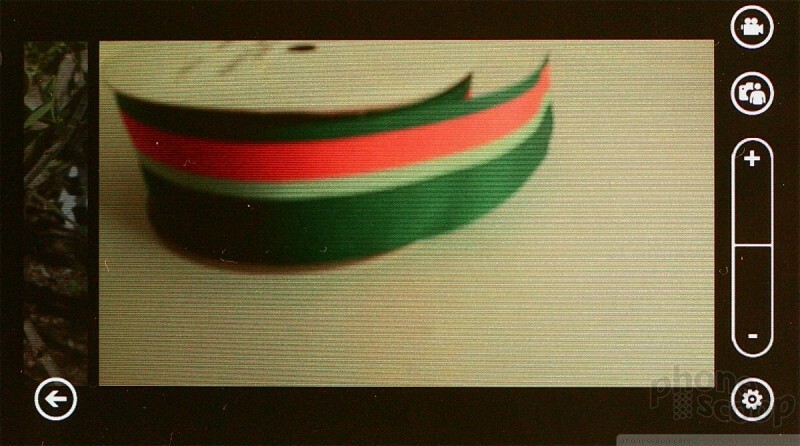 Music sounded excellent when sent to my favorite headphones, and video looked great on the screen. I do wish the T2 (and Windows Phones in general) was more compatible with content purchased from Apple's iTunes music/video store. Have I mentioned yet that the T2 has a 16-megapixel camera? Yeah, it does. 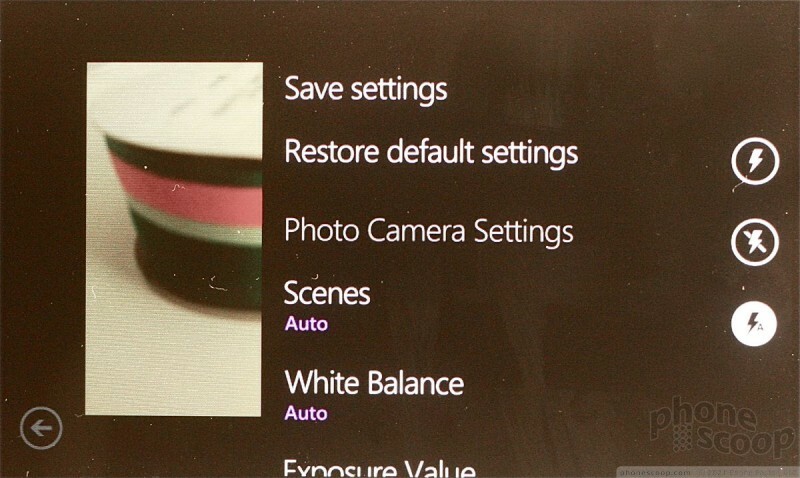 But the camera application itself uses the same camera software that's on all Windows Phone devices. 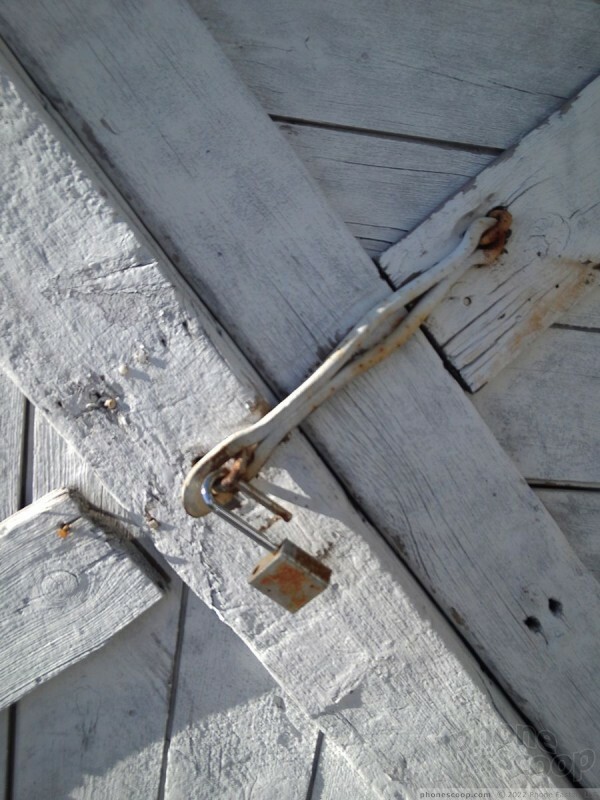 The camera can be opened at any time with a long press to the camera button, even when the phone is locked or in the middle of using another app. There is a box that appears in the center of the screen to help with centering the shot. Basic controls to access zoom and the video camera are stacked on right side of the display. The T2 offers a lot of tools for controlling the camera, including shooting modes, face detection, smile detection, scenes, burst shot, and of course control over the flash. One feature I liked is touch-to-focus. 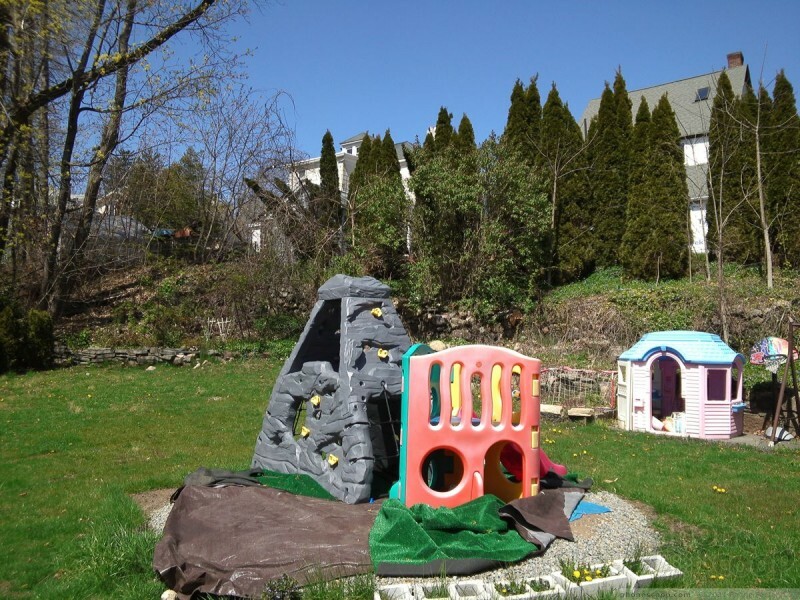 It works very quickly, and will focus on whatever object you select in the viewfinder. 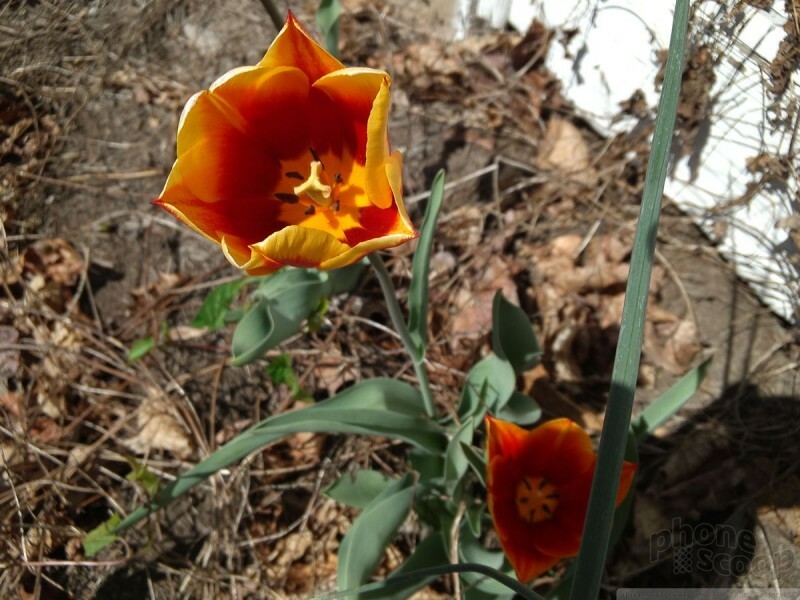 Once it focuses, it shoots the picture without requiring users to also press the shutter button. The physical camera key is great thanks to the really well-defined two-stage control. 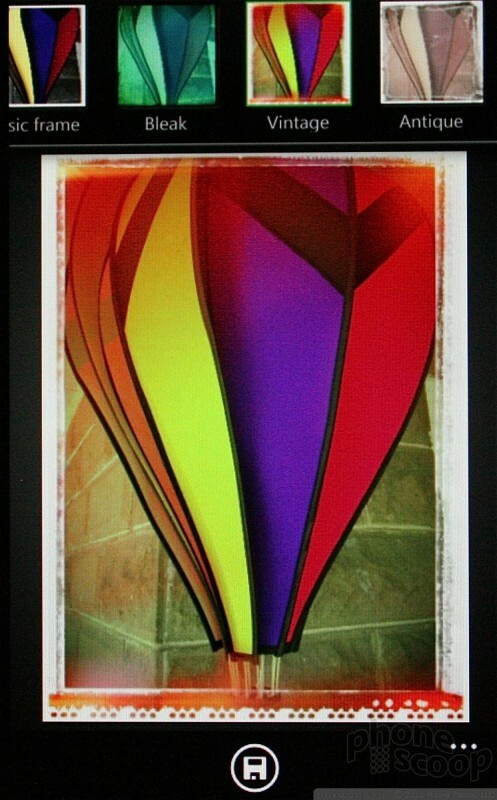 Once images are captured, they are whisked into the gallery app. 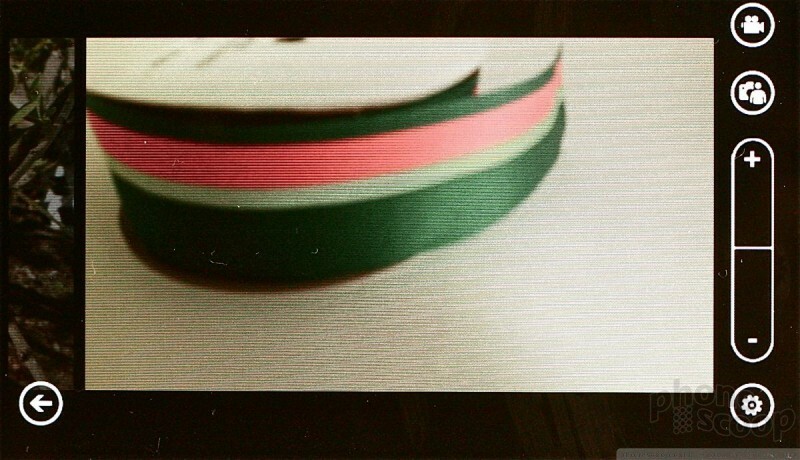 The right edge of the previous photo serves as the frame on the left side of the viewfinder. It's a quick reminder of what it is that you've most recently shot, and swiping it provides quick access to the gallery. 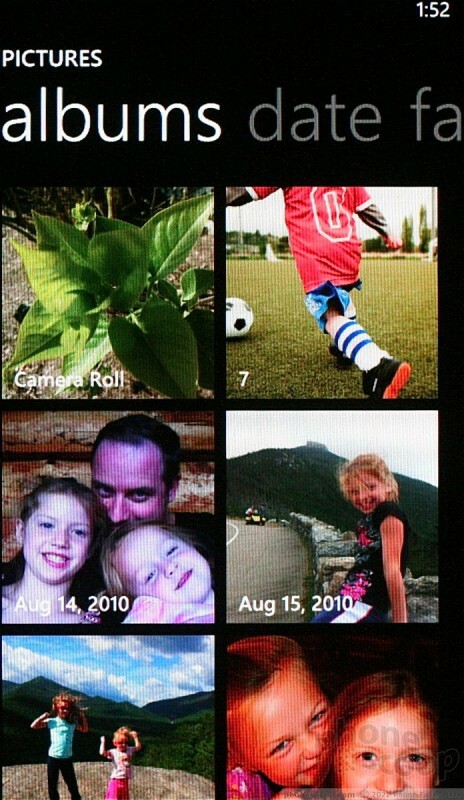 The Pictures Hub is an essential part of the Windows Phone experience. Your own photos are stored in the Pictures Hub, but it also syncs the photos shared by your Facebook friends into your library. The Pictures Hub looks nice, and is fun to use. 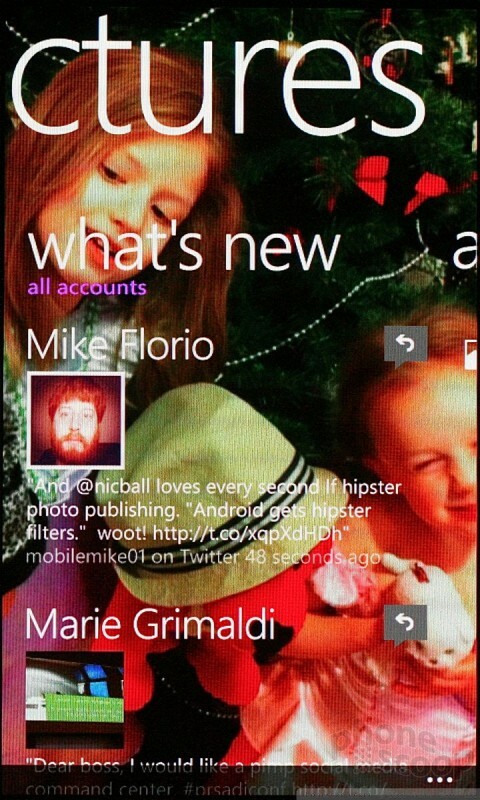 Pictures can also be loaded to a favorites list, set as wallpaper, and so on. Not many phones have 16-megapixel sensors. The benefit of a higher megapixel count is that you can blow images up to large prints that still look reasonably good. Honestly, I would have prefered if HTC spent the money on better low-light capabilities than the larger sensor. 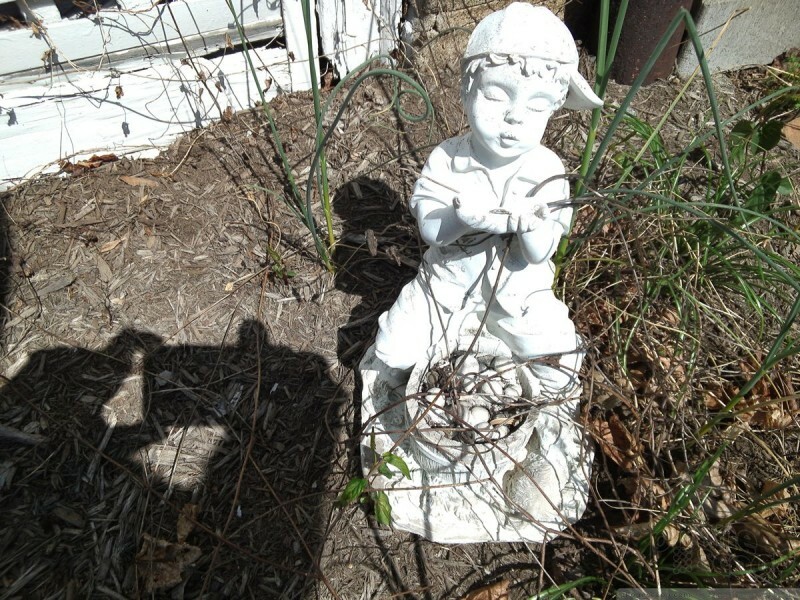 Photos look good, but not markedly better than any 8-megapixel cameraphone. 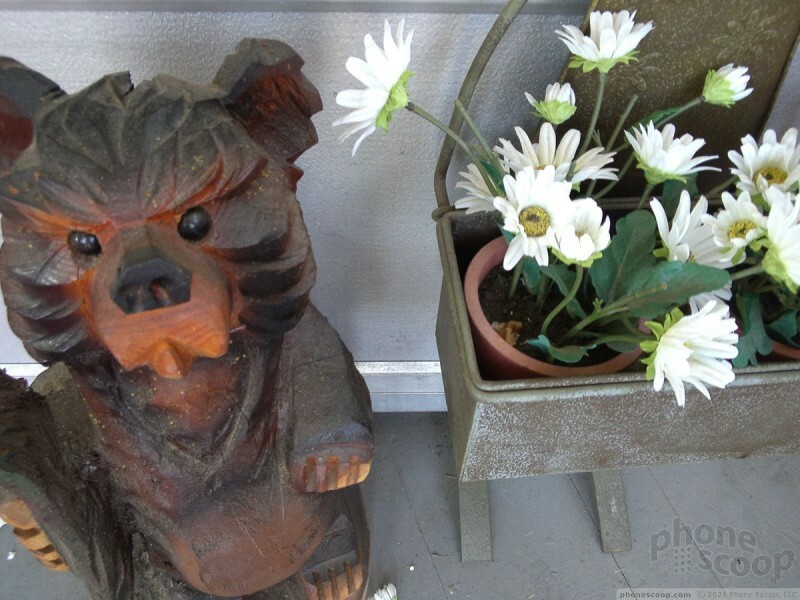 Focus was consistently sharp, colors looked accurate, and the images were free of grain/noise. With good lighting the T2 takes really good photos, and even when there's barely any light, the dual-LED flash is bright enough to ward off vampires. Even though it has a 16-megapixel camera sensor, the T2 is still limited to 720p HD video capture. This is Microsoft's fault, not HTC's, and it needs to change. 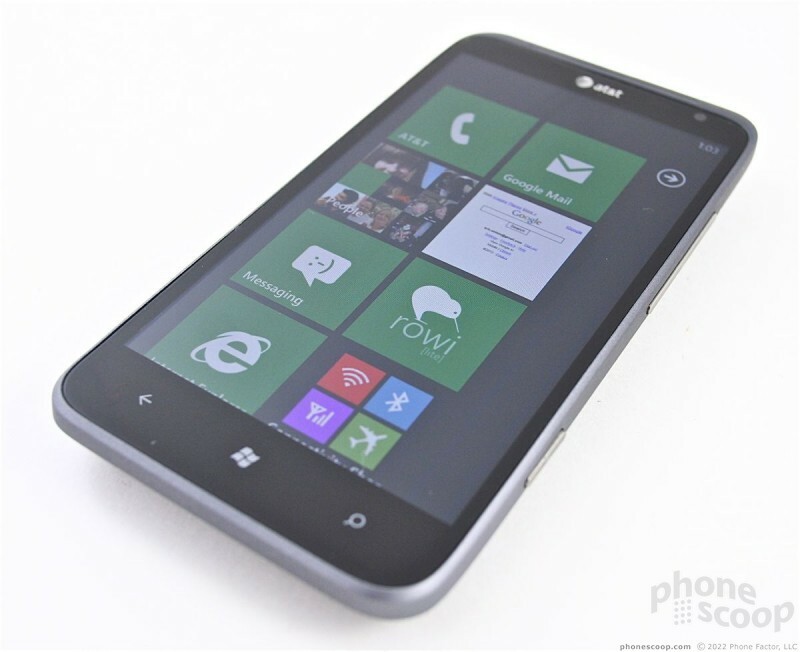 Nearly every other high-end device handles 1080p HD video, but not Windows Phones. That said, the T2 produced good video results. Exposure, color, focus, and all that were accurate the majority of the time. You'll be happy sharing the videos via YouTube and other web-based channels, though it's not as stellar on an 1080p HD TV. 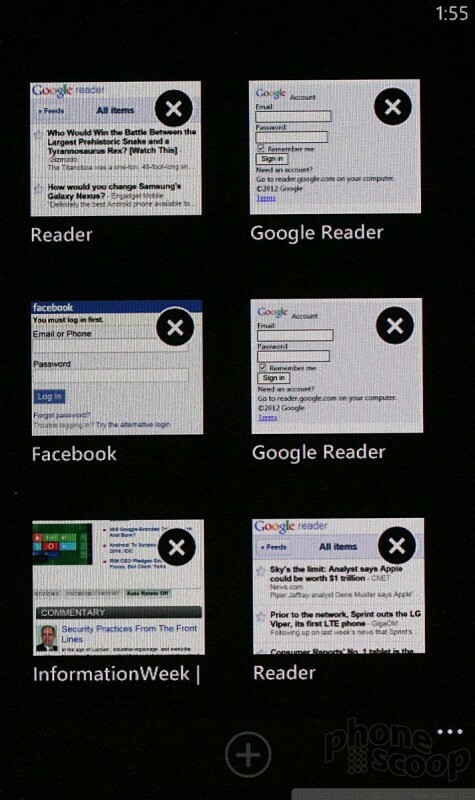 Windows Phones all ship with Internet Explorer, a decent browser that does a fine job of rendering HTML. During my tests, the browser loaded web sites over both HSPA+ and LTE at about the same speed — which was pretty quick. IE9 isn't based on WebKit which the browsers in Android and iOS are. I find the lack of WebKit limits the functionality of IE9 a bit, as I find it is better at rendering web sites on a phone. In terms of controls, the address bar is at the bottom of the screen instead of the top. The browser doesn't offer forward or back buttons; only stop or refresh. You have to press the three dots to the right of the address bar to access other options. 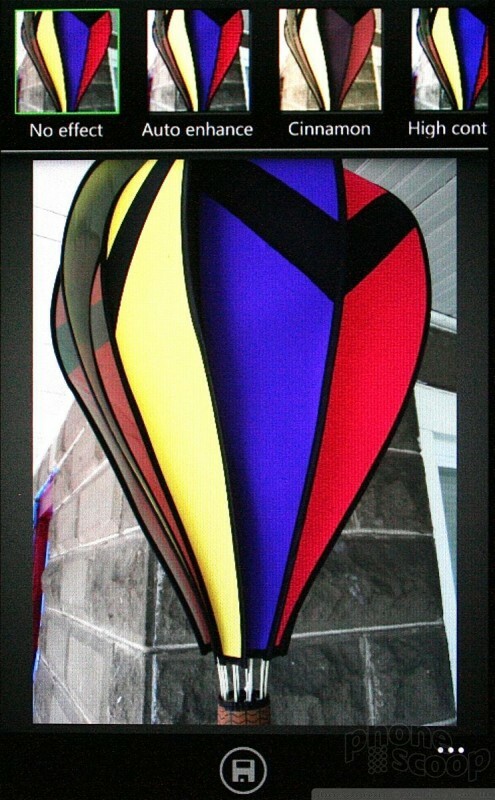 Web pages can be pinned to the start screen or easily shared via social networks. What stinks is that while there are some third-party browser apps available in the Marketplace, none of them are any good; the most important ones — Opera, Firefox, Chrome — are missing. 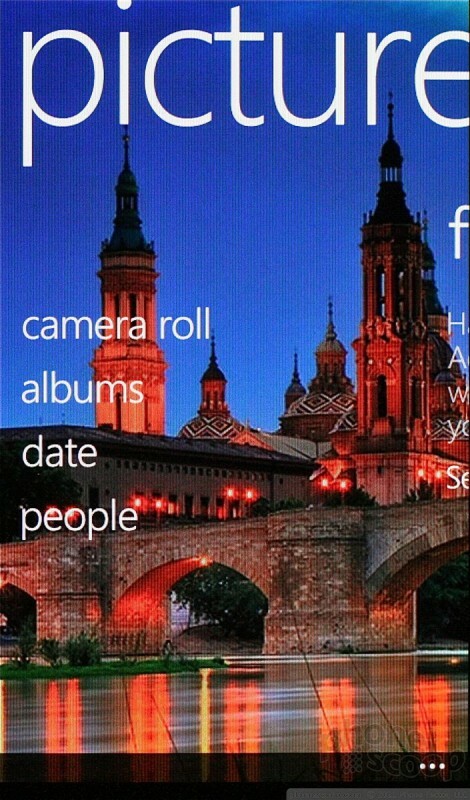 As for customizing your Windows Phone, the lock screen wallpaper can be switched up, the color of the home screen tiles adjusted, and the background set to either white or black. 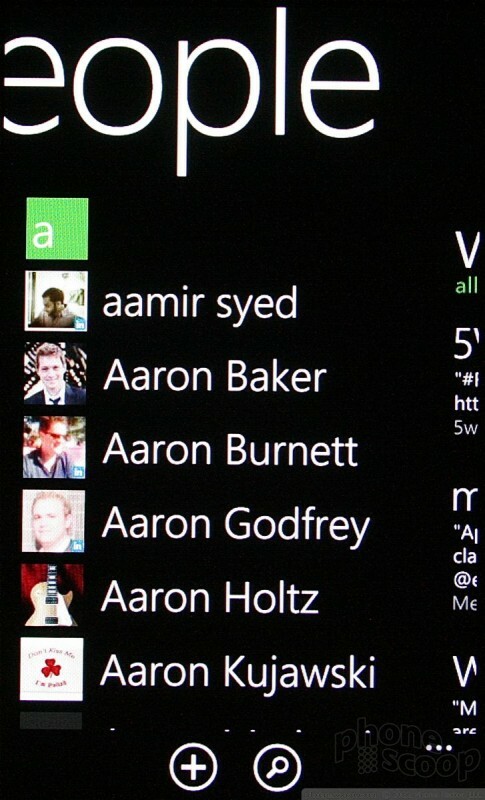 Other than that, you can only mix up the live tiles and hubs that are pinned to the home screen and set custom ringers. 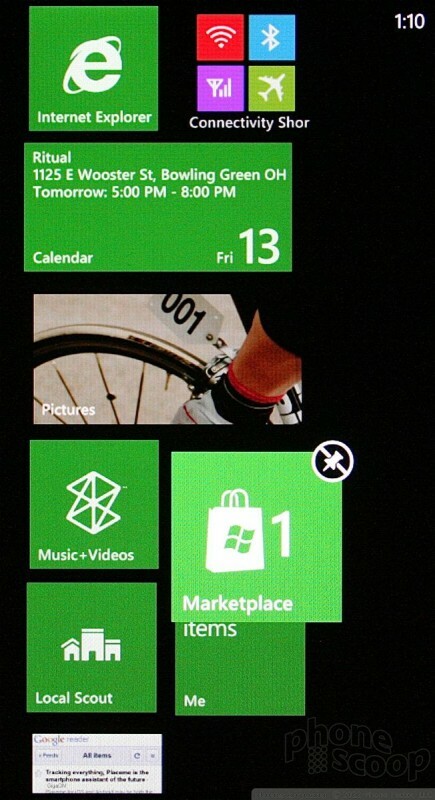 As noted earlier, there is only one home screen with Windows Phone, and there are no true widgets. The T2 has a significant number of AT&T- and HTC-branded apps pre-installed. In the Marketplace app, both AT&T and HTC have their own storefronts where you can poke through the few apps developed by AT&T and HTC that aren't already installed. 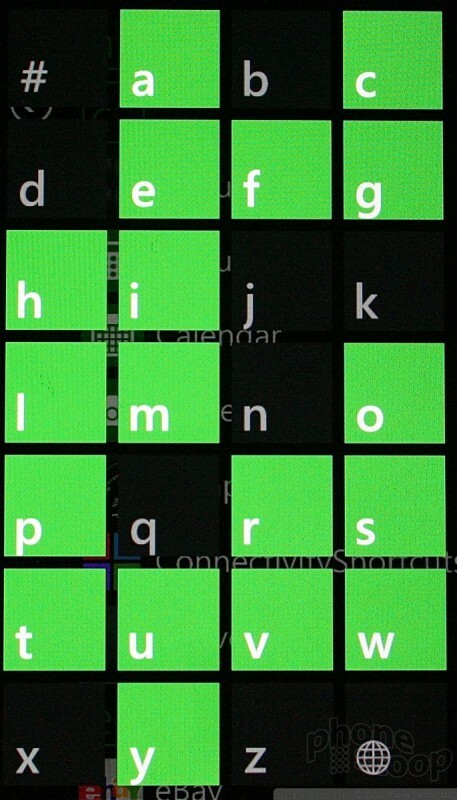 HTC hasn't gone to the same lengths of Nokia, for example, to create a solid set of exclusive applications for its WP7 handsets. Still, the Marketplace has more than 80,000 apps from which to choose. Bluetooth works exceptionally well on the T2. It paired easily with all devices. Phone calls sounded excellent through both mono headsets and my car's hands-free system. 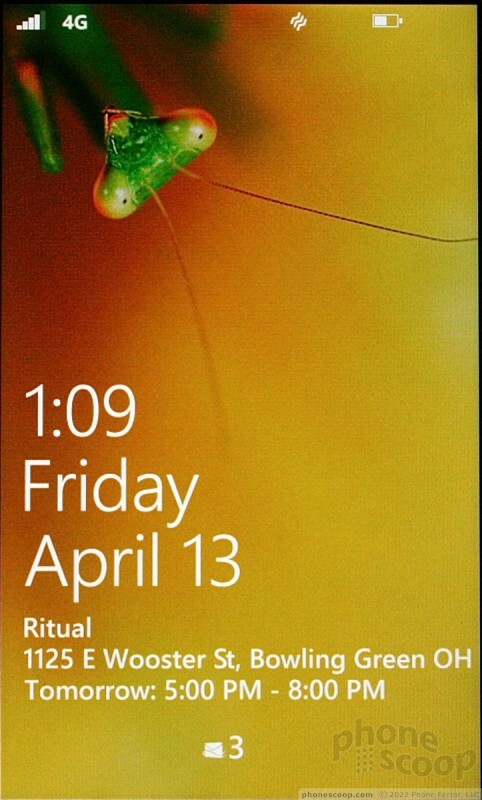 As with all WP7 devices, I don't care for the time/date on the lock screen. It's not easy enough to see when you're outside or anywhere that's too bright thanks to the white font. There are no ways to control or alter the position of the clock on the home screen. The T2 has AT&T Navigator and Microsoft's Bing Maps on board. The AT&T Navigator, which costs $10 per month to use, works well for planning routes. Bing Maps isn't quite as good for live navigation, but is excellent when used as an exploratory tool to see what's nearby. The GPS radio in the T2 works great, and consistently located me within 15 seconds. In NYC, it pegged my location down to the foot. In the end, the HTC Titan II is a tiny bit of a let down. I was expecting better. Aside from perhaps being a bit on the heavy side, the Titan II's hardware is fine. The display looks good and calls sound great. However, the waffle-y LTE 4G signal performance and poor 4G battery life leave me with some reservations. 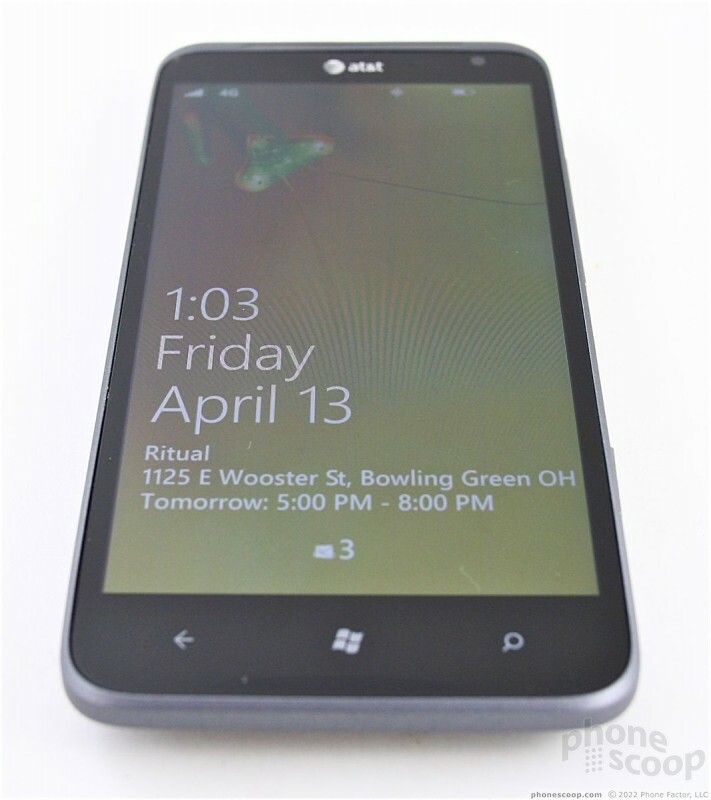 The user interface is owned by Microsoft, and that means the Titan II offers a consistent experience when compared to other Windows Phones. It is speedy, powerful, and offers plenty of tools for managing your communications, photos, media, and other apps/services. 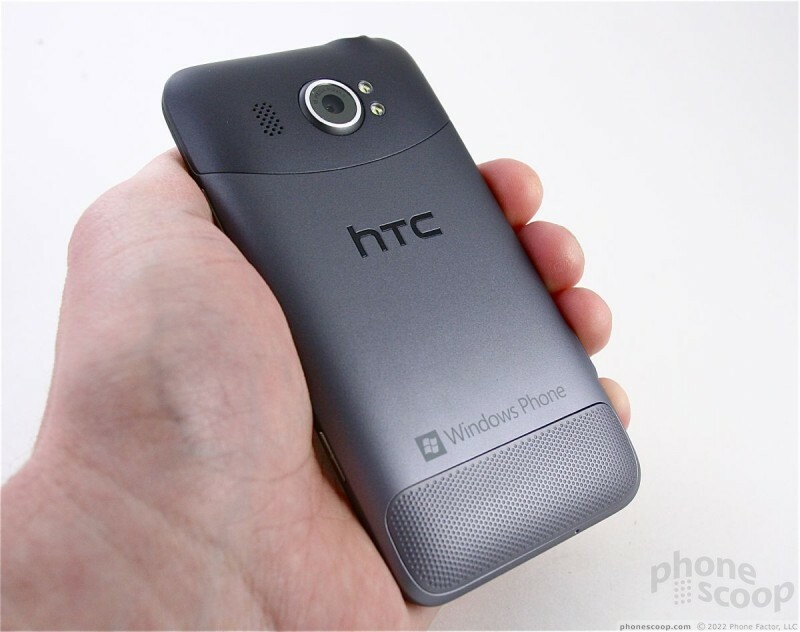 HTC did nothing special or extraordinary with the software on this device to make it stand apart from other Windows Phones. In fact, it did far less than Nokia to enhance the user experience. The camera, though, is the biggest disappointment. 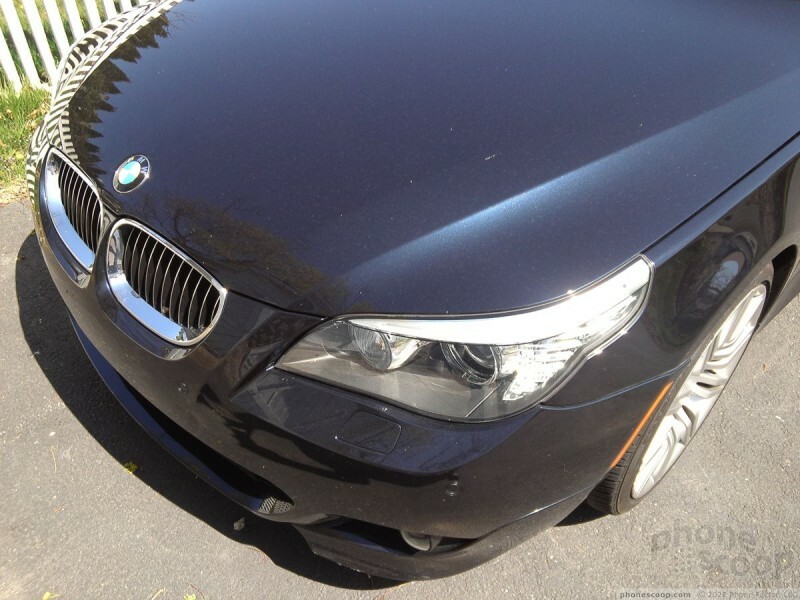 I mean, it's good, but when you buy into the whole "16-megapixel camera, dude!" concept, you expect better performance. In sum, the Titan II isn't going to sink like the Titanic - not by any means - but it's a hard call between the Lumia 900 and the Titan II. 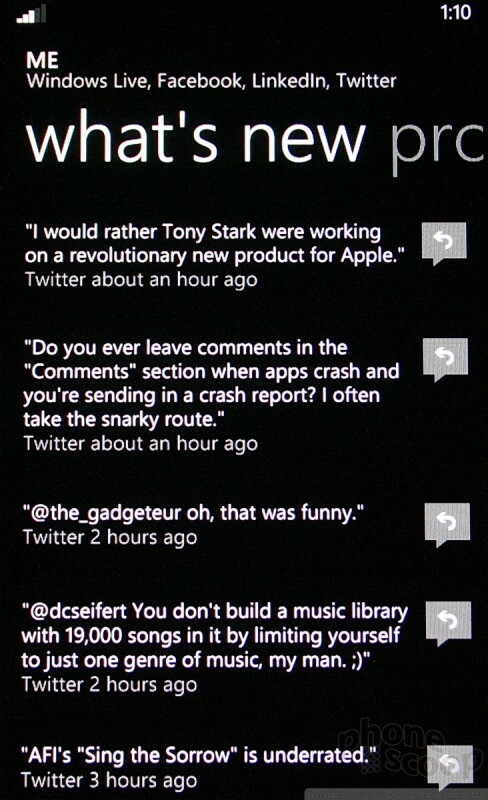 I'd recommend fans of Windows Phone go to an AT&T store and play with both in order to make the best decision.